We're accustomed to seeing service masts go straight up, with the service wires anchored to the mast. In this old install, please note that the mast extends horizontally for some distance from the house. Also note- it may not be so clear in this pic- that the utility guy wire attaches not to the mast, but to the wood brace that extends from the house. Were those braces support for some roofing overhang of the past...now removed...and the mast followed under it??? No, Dave...best I can tell, from the presence of these braces on numerous old buildings, they were once a standard way of supporting the service drop- back in the days of 30 amp services and #10 feeders! Why there are two, I just don't know. 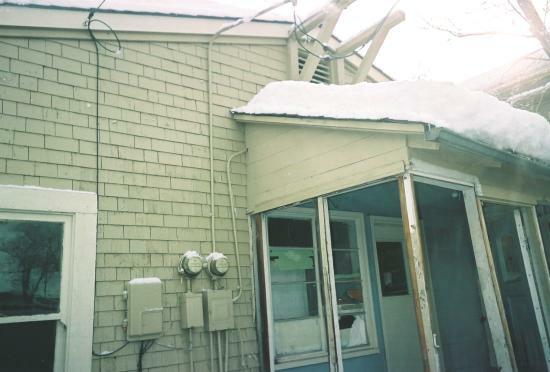 Another type of older support was a wood "Tee" projecting above the roof, with insulators. Maybe, just maybe, one brace received the service from the pole, and insulators were mounted on the second...I just don't know. 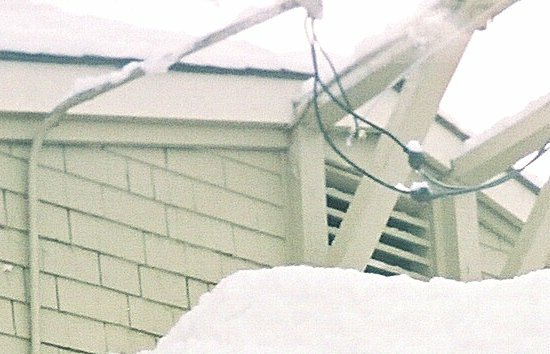 The Service Drop from the Utility Co hitting the wooden structure is perfectly acceptable when the riser does not go through the roof. This method is common with large overhanging eves. The riser is not very attractive... but leagal if strapped properly. The wooden structure hanging off the house looks more like "architectual trim" and probablly doesen't even attach to the house structurally.